Article abstract Several aspects of pyridoxine-dependent seizure (PDS) suggest a mutation affecting glutamate decarboxylase (GAD) as a possible cause. To examine the possibility of GAD linkage with PDS, the authors performed genotype analyses of three families using polymorphic markers near the GAD genes (GAD1 and GAD2). In each family, the affected siblings exhibited different genotypes for the GAD2 gene; in two families the GAD1 genotype was disparate. These findings suggest that a mutation of GAD is not directly involved in all cases of PDS. The two genes for GAD, GAD1 and GAD2, produce two protein isoforms (GAD65 and GAD67) that differ in cellular location and function. A genotype analysis using polymorphic markers indicated that in the three PDS families studied, a GAD mutation did not appear to be the primary causative factor of PDS. With the same method, we tested four other proteins involved in GABA metabolism and function and found no clear association with PDS. DNA samples were obtained from members of three white North American families, each consisting of mother, father, and two affected siblings (one male, one female). Family 3 also included a third unaffected male sibling. Family 1 was somewhat atypical in that neither child presented seizures until about 6 months of age, when infantile spasms developed. However, the younger female sibling showed a dramatic resolution of seizures and a normalization of EEG after 3 days of oral pyridoxine, which is good clinical evidence for a diagnosis of PDS. The male sibling, who was not correctly diagnosed until about age 8, had no overt seizure activity and normal EEG for 4 years while receiving no pyridoxine other than in his diet. His language and other cognitive skills were developmentally delayed, but significantly improved over the following year after pyridoxine treatment was begun. It is highly unlikely that in one family two siblings would have infantile spasms of different etiologies. In light of his sister’s diagnosis of PDS, the male sibling was also given a diagnosis of PDS, but of an atypical clinical variety. Patients in families 2 and 3 presented with typical PDS symptoms of neonatal onset, except for some initial responsiveness to anticonvulsants observed for the female in family 2 and the male in family 3. However, within 3 to 8 months after birth, both these patients required pyridoxine for seizure control (see Gospe and Hecht3 for complete histories of the older siblings in families 2 and 3). The affected siblings presented as neonates and were diagnosed at that time. All four patients have been treated solely with pyridoxine for 3 to 11 years. Polymorphic regions were amplified from genomic DNA by PCR for markers listed in the . Each PCR reaction included 100 ng patient DNA, 1 μCi [α-32P] deoxycytidine triphosphate (3000 Ci/mmol; NEN, Boston, MA), 1 mM unlabeled nucleotides, buffer (final concentration: 60 mM Tris-HCl, 15 mM [NH4]2SO4, 2 mM MgCl2; pH 8.5 or 9.0), 50 ng of each primer, 0.25 U AmpliTaq (Perkin-Elmer) polymerase, and water to 10 μL. After an initial 2 minutes at 94 °C, samples were cycled 30 times (94 °C for 30 seconds, 55 °C for 1 minute, and 72 °C for 1.5 minutes) followed by a final 7-minute extension at 72 °C. PCR products were mixed with an equal amount of loading buffer, denatured at 95 °C for 5 minutes, then separated at 60 W for 2 to 2.75 hours on a 6% acrylamide gel, which was then dried and exposed to photographic film for autoradiography. Pyridoxine-dependent seizure is an autosomal recessive genetic disorder.7 Affected siblings will, by definition, inherit the same defective allele from each parent and exhibit the same genotype at the affected gene locus. By analyzing the genotypes of affected siblings at different candidate genes, one can determine if the candidate is a potential cause of PDS. In all families the affected siblings inherited different alleles for the GAD2 gene (table and figure). 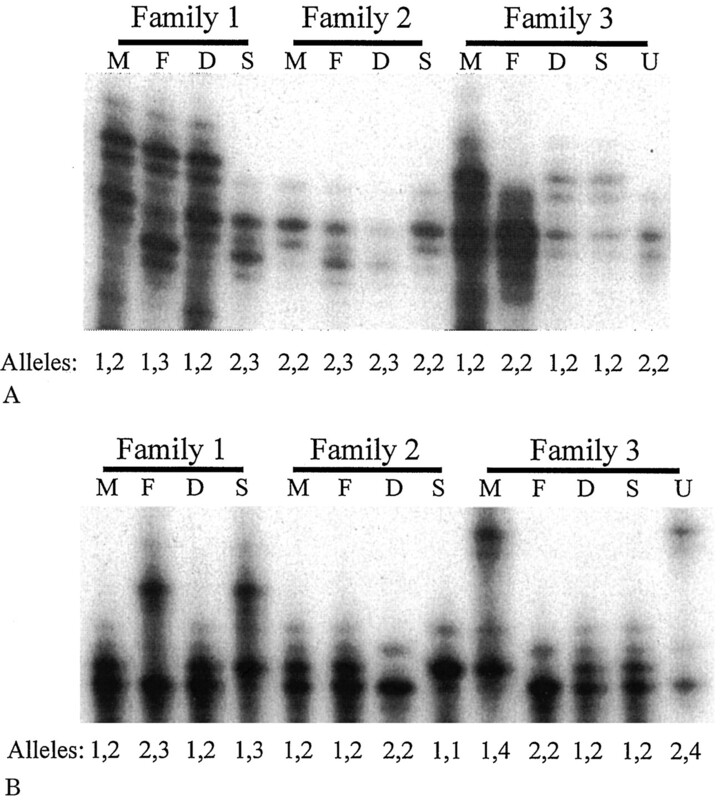 With the GAD2 intronic marker,5 siblings in families 1 and 2 had different genotypes. In family 1 the daughter inherited alleles 1 and 2, whereas the son inherited alleles 2 and 3. Family 2 siblings showed a different pattern; the daughter inherited alleles 2 and 3 and the son two copies of allele 2 (2,2). In family 3 the affected siblings had the same genotype with this intronic marker (1,2) but when tested with marker D10S588 (not shown) their genotypes were different (see table). For GAD1, in two of the three families the affected siblings had different genotypes with marker D2S2177 (see table and figure). For example, in family 2 the daughter’s genotype was 2,2 and the son’s genotype was 1,1. However, in family 3 the affected siblings had the same genotype with D2S2177 and D2S333 (see table) and therefore, GAD67 could not be ruled out as a cause of PDS in this family by this method. Figure 1. Autoradiographs of PCR products from polymorphic regions of patients with pyridoxine-dependent seizures and family members. Families are arranged as mother (M), father (F), daughter (D), and son (S). Family 3 also includes an unaffected (U) male sibling. Alleles are numbered from the left. Minor bands are probably polymerase stutter products. (A) PCR with GAD2 intronic marker.5 Family 1 siblings share a maternal allele (2) but paternal alleles are different (1 versus 3). In family 2 the siblings share a maternal allele (2) but paternal alleles are different (2 versus 3). In family 3, the affected siblings have the same alleles (1, 2); the unaffected sibling shares the paternal allele (2) but not the maternal (1 versus 2). (B) PCR with GAD1 marker D2S2177. Family 1 siblings share a maternal allele (1) but paternal alleles are different (2 versus 3). In family 2 the siblings have each inherited two copies of different alleles (2,2 versus 1,1). In family 3 the affected siblings have the same alleles (1, 2); the unaffected sibling has a different maternal allele (4 versus 1). Genotype analysis of other genes involved in GABA metabolism (see table) suggests that they are not associated with PDS. All affected sibling pairs had different genotypes for the vGAT and GABA-T genes. Inheritance of the GAT1 gene is similar to that observed for the GAD1 gene and in one family the affected siblings inherited different alleles of the pyridoxal kinase gene. In addition, a mutation in the GABA-T gene has been identified and the resulting condition is clearly discernible from PDS,10 as is the condition resulting from a mutation of the succinic semialdehyde dehydrogenase gene. These results strongly suggest that a mutation of GAD, or one of the studied GABA metabolic proteins, is not the primary causative factor for PDS. Further support for this result comes from a previous study of Asian families.8 Our findings extend those found in the Asian population to white North American families. Although GAD itself may not be involved, another unidentified protein associated with GABA production could be at fault. Currently, GAD regulation is poorly understood but it is known that PLP binds to and dissociates from GAD in an apoenzyme-holoenzyme cycle that alternately activates and inactivates GAD. A mutation of an as yet unidentified protein involved in this PLP cycle would be a prime candidate for an alteration of metabolism that leads to the low GABA and high glutamate levels found in some patients with PDS. Supported in part by grant MH35664 from USPHS/DHHS to D.L.M. Gospe SM. Jr. Current perspectives on pyridoxine-dependent seizures. J Pediatr 1998;132:919–923. Kure S, Maeda T, Fukushima N, et al. A subtype of pyridoxine-dependent epilepsy with normal CSF glutamate concentration. J Inherit Metab Dis 1998;21:431–432. Gospe SM Jr, Hecht ST. Longitudinal MRI findings in pyridoxine-dependent seizures. Neurology 1998;51:74–78. Deloukas P, Schuler GD, Gyapay G, et al. A physical map of 30,000 human genes. Science 1998;282:744–746. Wapelhorst B, Bell GI, Risch N, Spielman RS, Concannon P. Linkage and association studies in insulin-dependent diabetes with a new dinucleotide repeat polymorphism at the GAD65 locus. Autoimmunity 1995;21:127–130. Sagné C, El Mestikawy S, Isambert MF, et al. Cloning of a functional vesicular GABA and glycine transporter by screening of genome databases. FEBS Lett 1997;417:177–183. Scriver CR, Whelan DT. Glutamic acid decarboxylase (GAD) in mammalian tissue outside the central nervous system, and its possible relevance to hereditary vitamin B6 dependency with seizures. Ann NY Acad Sci 1969;166:83–96. Kure S, Sakata Y, Miyabayashi S, et al. Mutation and polymorphic marker analyses of 65K- and 67K-glutamate decarboxylase genes in two families with pyridoxine-dependent epilepsy. J Hum Genet 1998;43:128–131. Kaufman DL, Lederman JN, Wong AM, Tobin AJ, Menkes JH. A new method to detect point mutations in the gene for glutamic acid decarboxylase in patients with pyridoxine-dependent seizures [abstract]. Ann Neurol 1987;22:446–447. Medina-Kauwe LK, Nyhan WL, Gibson KM, Tobin AJ. Identification of a familial mutation associated with GABA-transaminase deficiency disease. Neurobiol Dis 1998;5:89–96.